With Pac-Man Championship Edition for Xbox Live Arcade, Namco Bandai set the bar for the evolution of its pellet-munching mascot. 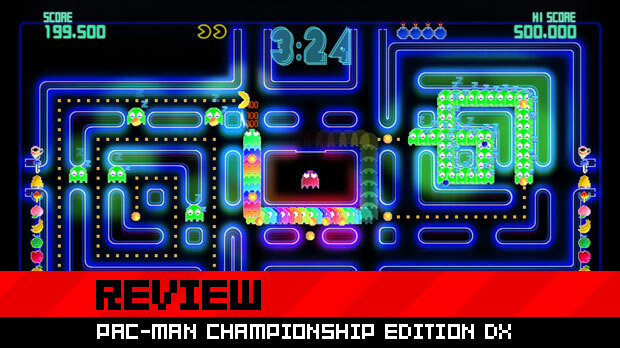 Now, the little yellow hero is back with Pac-Man Championship Edition DX, and despite the fact that the name indicates it’s just a fancier version of the original, what Namco has delivered is an experience that’s all its own. It’s also one of this year’s best and purest arcade experiences, and simply a must-buy. At its core, DX is similar to the classic Pac-Man game -- there’s a maze, you eat pellets, and you avoid ghosts until you munch a Power Pellet and then give them the what for. 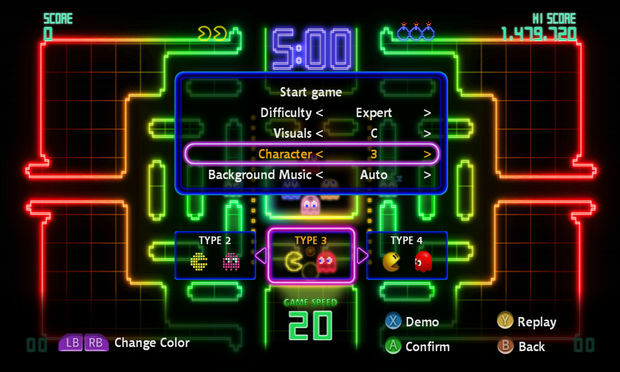 With Championship Edition, Namco enhanced the heart of that experience by adding a timer and a maze that morphed as you played. In DX, all of that applies, with the addition of the ability to wake up napping ghosts as you pass them on the board. By doing so, a chase ensues, as dozens of ghosts trail behind Pac-Man. As the maze morphs (triggered by collecting a fruit from the opposing side of the screen), certain patterns will have the coveted Power Pellet waiting for Pac-Man to devour it. At this point, it’s on, and you can imagine what happens as Pac-Man turns his attention to the train of ghosts that have been pestering him up until this point. Yes, Pac-Man gobbles them all up in succession, his speed increasing the more he eats. To paraphrase Destructoid’s Jordan Devore, it’s absolutely orgasmic. There’s nothing quite like turning your attention on and then burning through an entire horde of pesky ghosts. Maybe it’s a combination of triggering the classic “ghost eating” sound effects countless times in rapid succession, or some odd long-time ghost genocide fantasy fulfillment that makes it so pleasurable and addicting. But whatever the case, the word “orgasmic” manages to sum it up perfectly. DX is also actually more approachable than almost any Pac-Man title before it, and I’d argue that almost anyone -- even your grandmother! -- can pick it up and have fun. Much of this has to do with two new additions to the game -- bombs and bulletime-style slowdowns. Bombs can be triggered at any point, sending every ghost on the screen back to its “home” in the center of the maze, buying you some precious time and avoid narrow deaths. 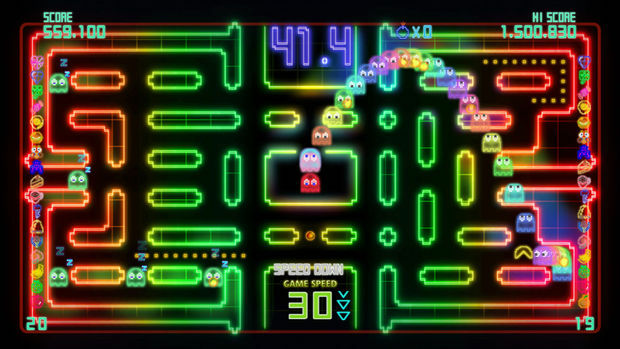 The game’s slow motion will occur at any point that a ghost gets too close to Pac-Man, allowing the player to choose the next move wisely, and narrowly escape death. In many ways, this makes playing the game easier, but only in the sense that for many players it will eliminated frustrating deaths and restarts. It’s extremely rare that, in any of the game’s modes -- whether it be a score attack or a time trial -- you’ll lose all of your lives. Because of this, playing DX might feel more fulfilling to more players than ever before; everyone’s favorite part of Pac-Man certainly was never its “Game Over” screen. But to allay any fears that this might make the game too “easy,” understand that just because these new gameplay devices make it harder to “lose,” relying on them isn’t your best bet for obtaining “expert” scores. Bombs, for instance, not only reset ghost trains (making them less predictable), but also slow down Pac-Man. 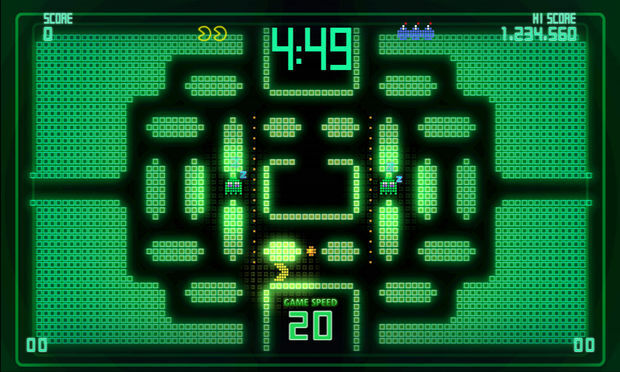 Those slow-mo near-misses may seem like a godsend until you realize that while the speed of Pac-Man and the ghosts is decreased, the ticking clock is not. Good players will only use bombs when absolutely necessary and avoid near misses at all costs. The best players won’t use bombs at all, and keep narrow escapes to a minimum through a mix of pattern memorization, quick thinking, and a fast thumb. 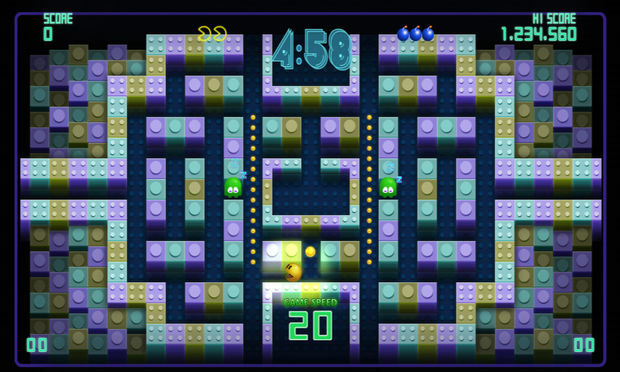 DX is also packed with content, including eight maze styles, most of which can be played as a time trial (collect X-number of fruit as quick as possible) or score attack. This also includes the original Championship Edition maze, which is a nice addition, but only really serves to highlight how much Namco improved its maze design with its newest offerings. Additionally, there are “Darkness” modes available of the maze types, which limits the player’s field of vision, making it more difficult to plan routes and react. With a few exceptions, most maze and game types have their own leaderboard, making DX the perfect game for folks who like to compete for high scores. The game does a pretty decent job of keeping track of your global rank, telling you when you’ve ranked up or ranked down on most of the game’s selection screens. What’s unfortunate is that when it comes to actual leaderboards navigation and accessibility, DX is a bit of a mess. Part of it stems from the fact that there are just so many damned boards to keep up with, for sure. But while games like Bizarre Creation’s Geometry Wars and Criterion’s Need for Speed: Hot Pursuit do a great job of highlighting where you stand versus friends at every turn, the developers of DX seem to have tried to make it arduous as possible. In order to see anything beyond where your global ranking, players must navigate a seemingly endless trail of menus, which may be one of the most complicated mazes in the game. Even after navigating through various leaderboard menus, you’ll find that a list of your friends scores doesn’t even include your own. In order to compare you need to navigate to another menu to check your ranking, and then journey back to your friends leaderboard. While it may seem like I’m making a commotion about nothing, the labyrinth-like leaderboards and laborious menu set up is contradictory to what will extend the life of DX almost indefinitely -- competition against your friends. It’s a frustrating misstep in an otherwise perfect arcade gaming experience, and simply the only thing between me and giving the game a flawless score. Those gripes aside, there’s simply no reason for a gamer not to own Pac-Man Championship Edition DX. It’s an absolutely hypnotic experience, one that simply feels good to play, whether in short bursts or as an alien-abduction-like time-eater. It’s a game that’s as timeless as the original, and while it probably won’t reinvigorate Pac-Man as a cultural phenomenon, it’s certainly an amazing step towards making the series relevant again.